What’s wrong with this calf ? He’s real short coupled. Short stubby legs, short neck, funny shaped head. Doesn’t move well and lays around all the time. He older than some of the others and way smaller. He’s built like a midget. I banded him yesterday and he only had one testicle. 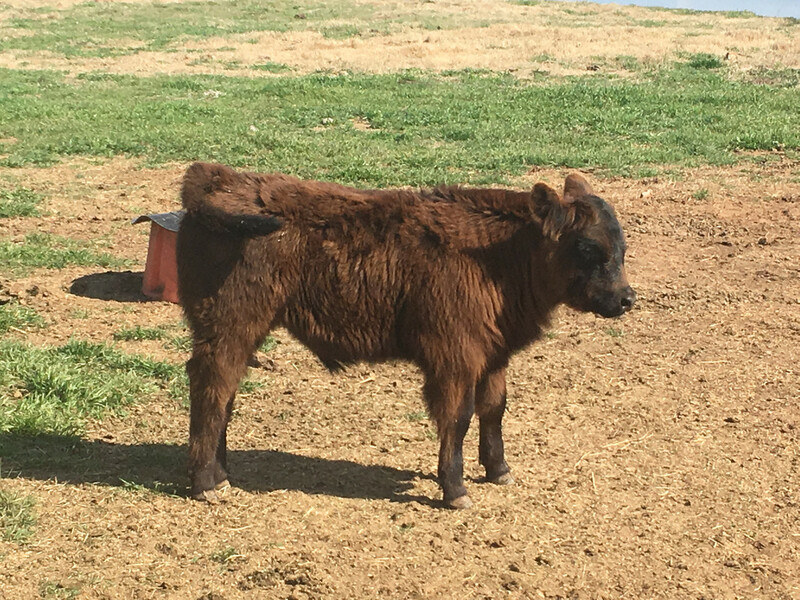 Re: What’s wrong with this calf ? He is a stubby little dude! Cross, I got nuthin' but seem to recall a fairly recent post about a possible dwarf calf. Somebody posted something awhile back. I searched for it but I can’t find it. His mother has raised really good calves in the past, same bull and everything. Only thing is she had a lump on her jaw last summer. Lanced it and gave antibiotic. Could he be a PI (BVD), more often in calves from heifers but also mature cows calves if no previous exposure? Just your common dink. Take your $200 and move on. Give the cow another chance if she ain't real old. Sometimes there just seems to be a genetic mash up that brings on one of these. The buyers for for kids rodeos like them. One step above mutton bustin. What is the breed? Dwarfism is common genetic defect in English cattle. Momma cow got hooked up with the neighbor's miniature Dexter bull. Angus and Hereford are the worst for dwarfism. If I remember right dwarfism is more easily repeated in Angus versus Herefords. It is only one gene involved in the Angus deformities versus multiple in the Hereford. The Hereford deformities often result in snorter calves. I know SH are effected by the deformities as well, I don’t recall ever seeing one. I not sure banding one nut is a good ideal. The only ones I have seen if left alone the other nut will drop later. Now it will never drop. He was born December 26 so it should be down by now. I felt around good to make sure it wasn’t just sucked up. I’m positive he only had one. I don’t think he has much hope of making it. He’s getting heavy and wide and not getting around very well. Genetics is the problem. Everything I have ready and the pictures I looked at tell me flat out that genetics didn't give him a chance. He won't make it to finishing weight. If he does, it will be beyond 30-months, which makes him a "hard-bone"
Doesn't appear to be a dwarf to me. Other issues at play methinks.